Do you have a ham radio or other shortwave/HF radio website and want to display propagation information to your visitors? PropagationStats is a small bit of code that can be easily added to your radio-related website to display current radio propagation condition information. Once installed, your website will have a graphical indicator showing the current radio propagation indicies (A-Index, K-Index, and Solar Flux Index) and will also show HF radio propagation blackout alert information. Ham Radio operators, shortwave enthusiasts and others interested in high frequency (HF) radio propagation conditions will appreciate this addition to your site. PropagationStats is free of charge - my only request is that if you do use it on your site, that you keep the links back to www.n0hr.com in-tact. PropagationStats grabs its data from the same place as the WWV radio propagation transmissions. These broadcasts originate from the U.S. National Institute of Standards and Technology radio station WWV in Ft. Collins, Colorado at 18 minutes past each hour on shortwave frequencies of 2.5, 5, 10, 15, and 20 MHz. The same information is broadcast at 45 minutes past each hour on radio station WWVH in Hawaii on 2.5, 5, 10, 15, and 20 MHz. Once loaded in your visitor's browser, current propagation indices are displayed in the bottom of the window. 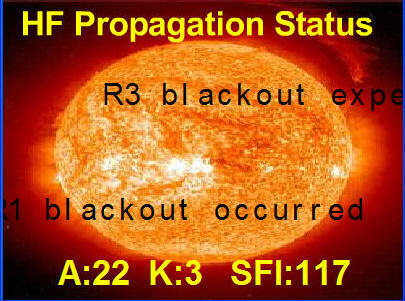 Radio blackout information is presented after the image has completely loaded and will scroll across the screen from right to left. The lower line presents radio blackout information for the past 24 hours. Solar flux is a measurement of the intensity of solar radio emissions with a wavelength of 10.7 cm (a frequency of about 2800 MHz). The value broadcast is in solar flux units that range from a theoretical minimum of about 50 to numbers larger than 300. The A and K indices are a measurement of the behavior of the magnetic field in and around the earth. The K index uses a scale from 0 to 9 to measure the change in the horizontal component of the geomagnetic field. A static image of the PropagationStats tool is shown below and the current real-time PropagationStats tool should appear in the left part of this page. Insert this piece of code into your ham radio related webpage. Please make sure that the entire piece of code above remains in-tact. That includes the link to "Add PropagationStats to your ham radio site". By keeping that line in-tact, others will be able to find the tool and the N0HR.com website in general. In other words, this utility is not pay-ware or shareware - but link-ware. My only request is that keep this link back to the n0hr.com website. I would also appreciate any other links to my site from yours (your links page, articles, or anywhere else on your site). Note: If you are interested in HF Radio propagation conditions and you use the Firefox web browser, you'll want to check out Propfire an extension that shows radio propagation indices in your status bar. You'll also want to check out my links on ham radio propagation. NØHR.com: Ham Radio Links: Antennas, electronics, lightning and grounding protection, software, DXing, towers and more.